A Chicago street in bright sunshine. Jack Reacher, strolling nowhere, meets an attractive young woman, limping, struggling with her crutches, alone. Naturally he stops to offer her a steadying arm, and then they turn together – to face twin handguns held level and motionless and aimed straight at their stomachs. Chained to the woman, locked in a dark, stifling van racing 2,000 miles across America, Reacher needs to know who he’s dealing with. The kidnappers are saying nothing and his companion claims to be Holly Johnston, FBI agent. She’s fierce enough and tough enough, but he knows there must be more to her than that. And at their remote, hostile destination, they will need to act as a team and trust each other, pitting raw courage and cunning against insane violence and seemingly hopeless odds, with their own lives and hundreds more at stake. 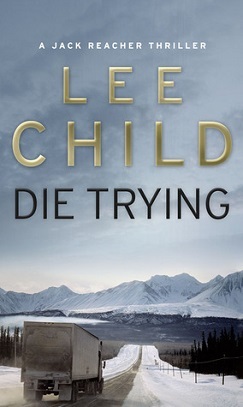 Normally I love a good Jack Reacher novel, but this one was slow-moving and more … emotional than the others I have read. While it’s true that I have read them out of order, this is a very different Jack Reacher than in later novels. But I am getting ahead of myself. The story revolves around the kidnapping of one woman on purpose, and Jack by accident. The woman is an FBI employee, who constantly whines about being the daughter of a high-ranking government official. The militants who capture them are seriously crazy, and at least one has a very dark streak. Like other Reacher novels, it is full of fighting, figuring, weapons, and pretty straightforward. What I didn’t like about this one was it was a bit long in the tooth. I felt that it could have been edited down to be more succinct. Also, the FBI Agent’s whining got thin quickly. And Jack was so much more emotional. His line of questioning on whether or not his fellow captive had a boyfriend was shockingly out of character. All-in-all, while this was a fast read, I can’t recommend it as one of the better Reacher novels.